The anti-ageing procedure is aimed at stimulating microcirculation and the natural processes of collagen production and regeneration. Micro-punctures are being inflicted by hand, in the region of the most prominent wrinkles or skin changes, and the wider facial skin areas. Microneedles penetrate the skin to the depth of 0,2 – 0,75mm and the procedure is considered to be painless. Treatment results include: skin hydration, increased skin tone and smoothness causing existing wrinkles to be less visible and skin younger looking. Results become visible 24 hours after the procedure and shall last for a few months. The procedure is repeated up to three times 10 to 14 days apart. Phi-Ion anti-ageing treatment is based on creation of series of minute dots adjacent to the tension lines on the skin. This process triggers an instant contraction and tightening of skin fibers to create a lifting, remodeling and rejuvenating effect. Phi-Ion pen uses the plasma state of matter. The principle involves the ionization of gases from the atmospheric air to create micro electrical discharge causing sublimation of the excessive/sagging superficial skin layer. This method can be used to treat specific areas of concern without damaging the surrounding tissue or applying unwanted heat energy to them. 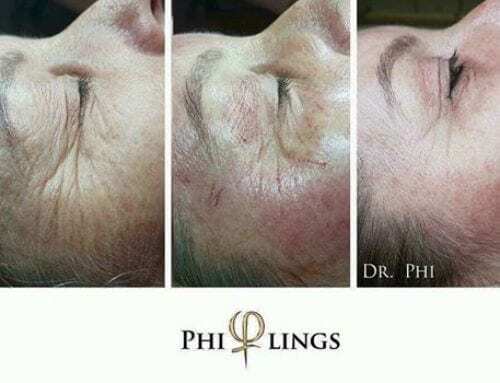 Phi-Ion treatment provides baggy eyelid correction, can be used for wrinkles tensioning-crow feet, marionette lines, it is used for acne scars improvement. This revolutionary method is capable of achieving results comparable to the results of the cosmetic surgery. One treatment is usually enough to achieve desired results. After 1 month, on check-up appointment, the artist determines if an additional treatment is necessary. The results are expected to last for at least 9 months.